Chip Kelly (left) puts the pedal to the metal and Ryan Booher builds a team that at least in theory, is going to make television commentators and analysts gush like school girls at a boy band concert. Photo by Wade Rackley. …it is that “box” that I think most often times gets coaches fired. Fear of trying something new. Given the size, speed, and intelligence of defenders today, I need coaches that can give defenses pause when trying to play w/ the attacking, intimidating style that they love to use. Somehow, in the mass of RSP Project submissions, I forgot to post Ryan Booher’s roster Q&A. I’m not sure why, because I was fascinated with his desire to use high-tempo, Oregon/West Virginia/Oklahoma State spread looks in the NFL. I love his willingness to embrace an aggressive offensive scheme. Booher’s Q&A is an excellent presentation of a team and he’s one of the few writers/readers that I’ve seen thus far talk about the fit with chemistry between personnel, coaches, and strategy to build a strong team. While there is a difference between theory and practice, this is one of my favorite teams. I have follow up questions for him that I hope I can have answered tomorrow in time for Reads Listens Views. Here’s Booher’s roster if you need a quick refresher of his personnel. Matt Miller, Jene Bramel, and Scott Kacsmar, and Chase Stuart have finished their rosters. Russ Lande is working on his right now. Great stuff ahead. Darron Thomas might not be in the NFL, but I see the logic of taking a successful component of Chip Kelly’s Oregon system and giving him a shot as a role player. Photo by Wade Rackley. Offensive Personnel/Formations: The offense is going to be a fast-paced, no-huddle attack built around players that can attack defenses from a multitude of positions and alignments. Every week, an offense faces defenses that have different strengths and weaknesses. The purpose of my offensive personnel is to be able to attack every defenses weaknesses, whether that be by playing a smash mouth running style, or spreading the defense out and throwing the football all over the field. The no huddle won’t be necessarily used for all 60 minutes, but when the defense has players on the field that can be exploited we’ll go to it and if that means for much of the game, so be it. First down is absolutely critical for us. A simple goal of at least four yards to keep us ahead of the chains is a primary objective. Our commitment to the running game, combined with our regular use of multiple tight ends will ensure that later in the game, we can get chunk plays with play action. Our base offense is primarily a west coast offense, and keeping with the usual there, our first 15 plays will be scripted to try to see how the defense is going to defend specific personnel groupings and formations. The old adage goes that “motion causes emotion” and almost all of my skill position players can be moved around to help the defense not only show its hand, but to get the defense thinking. Formations, formations, formations. 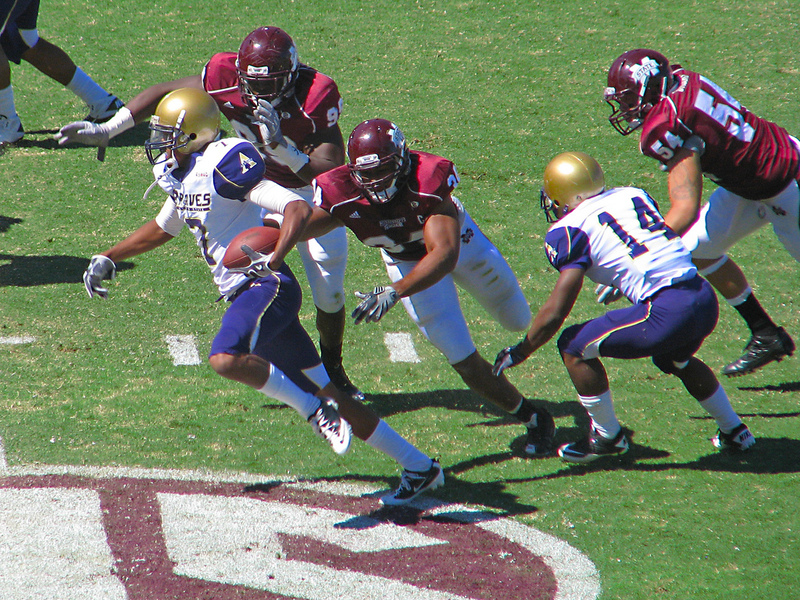 Many defenses have built in checks to Cover 1 and Cover 3 depending on the personnel and alignments on the field. One common check is to go Cover 1 when seeing a bunch look or trips. This helps give the quarterback easier, more defined reads. One of the beautiful things Stanford did with Andrew Luck was use heavy packages with three and four tight end’s at a time. If the defense stayed in its base look expecting a run, Luck simply spread the field and took advantage of his mismatches. If they went nickel to defend the pass, he simply kept everyone in tight and ran the football. Football is not an overly complicated game, really in a nutshell it is a numbers game. Doing some of the things like the read option game help keep defenses away from the exotic looks they like to give to create confusion. The same thing applies with 12 personnel. Deception also helps to slow the defense and prevent it from doing what it wants to do. It’s the toe-to-heel mentality. 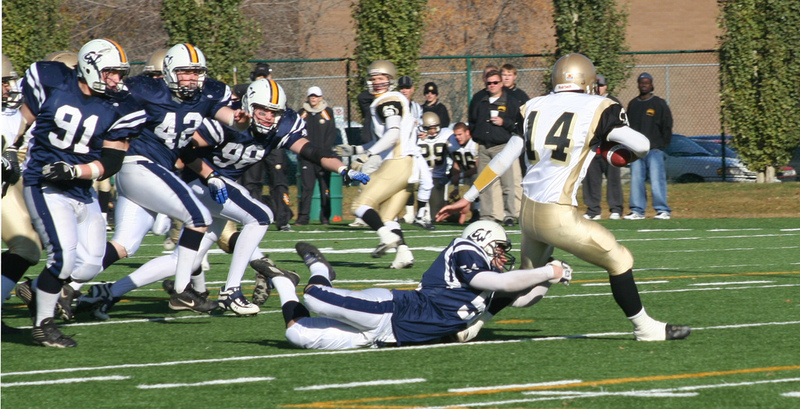 When in shotgun, simply crossing the runner in front of the quarterback creates hesitation from the defense. The thing that is most advantageous with all of these different ways of attacking is you create much bigger windows for the quarterback to throw the ball, and Luck is the perfect catalyst to take advantage. I am not a believer in the old-school thought process that teams don’t pull elite quarterbacks off the field for wildcat and gadget packages. I would not want to run the Oregon spread with Andrew Luck, but I can run the Oregon spread with the quarterbacks that I have on the roster for that offense. I want to give defenses as many things as possible to defend against, and adding their read-option offense to my base offense will help do this. Both Josh Portis and Darron Thomas have shown an ability to make good throws, and once the defense begins to creep up to stop all of the run plays I will show, they can take advantage of windows that they will find to be much bigger to throw into. Combining both types of no-huddle will ensure that the defense is gassed by the time the second half winds down to the fourth quarter. Defenses will not only need the required athletes to deal with the pace and myriad of formations, but they better have the ability to communicate effectively, as one mistake and it can be dire circumstances. Kelly-Thomas? Jim Harbuagh-Andrew Luck? See a pattern developing here? It’s like the Pac 10 is getting the old band back together. Photo by Derek Peterson. Blocking Schemes: Our blocking schemes are primarily going to be zone blocking with the occasional power schemes sprinkled in. All three of my interior linemen have exceptional athletic skills and they can all be effective pulling and getting ahead of runs to the perimeter. They also have the skills to be able to run any of the inside zones and traps that are required in this offense as well. I spent considerable resources on both of my tackles, as I want to help guard against pressure from the edge. All linemen have versatility, and are intelligent players that can ensure that mental mistakes are far and few between. One of the things I don’t think enough teams do is use the option of the sixth linemen, as a tackle eligible. In short yardage situations, this is one way to help block against eight-man fronts. As Jim Harbaugh showed last year throwing to both offensive and defensive linemen, teams react accordingly when they believe the run is coming. No matter which starter were to get injured, I have the backups and the players versatile enough to have confidence that our offense can continue to run without a hiccup. Bread and butter of the offense? 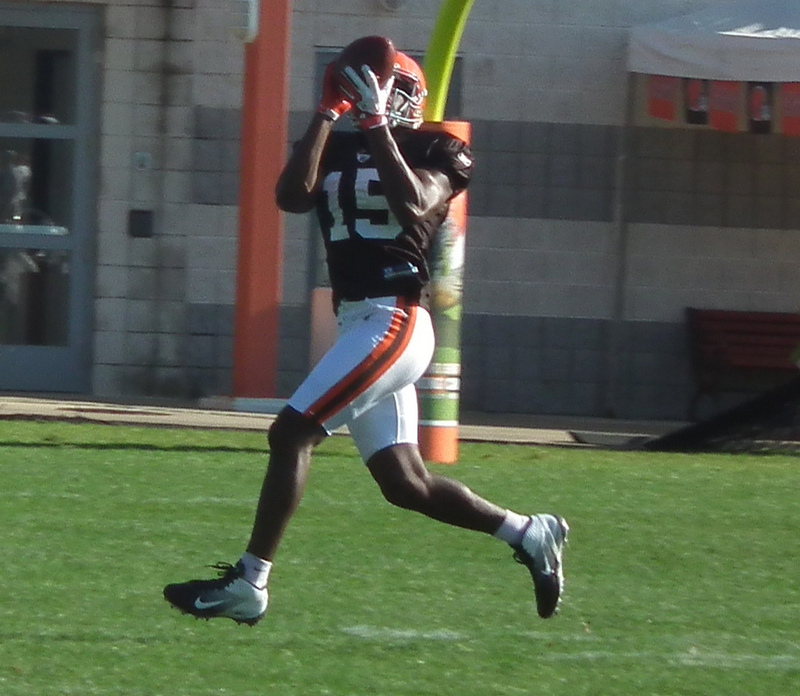 Greg Little could be the whole loaf if he plays to his potential. Photo by Erik Daniel Drost. As stated earlier, the saying goes that motion causes emotion. Any play involving misdirection, shifts, trades, or motions are going to be used. Bill Walsh used to say he didn’t necessarily run a whole lot of plays, he just ran them out of different looks. For my quick-passing game, slants, digs, and curls are going to be used a lot. Flanker drive is an obvious staple of the offense, and given the receiving skills of my tight ends and H-Backs, a lot of throws are going to be up the seam. When I run the diamond formation, flat routes and wheel routes are going to devastating against opposing defenses. The diamond will be particularly useful in the red zone, because it will help create one-on-one match ups outside for both Greg Little and Lester Jean. When we go spread, and the defense doesn’t match up in man, expect a heavy dose of bubble screens as well for my slot receivers. One of the other things that will be built into the offense will be “packaged concepts” and depending on what the middle linebacker does, he will not be right. These will be used a lot from a trips look, as it helps isolate the middle linebacker. We simply read him, and if he plays pass, we run the draw. If we creeps up, we hit the throw right behind him. You don’t run a zone blocking scheme without the stretch run being one of the go-to plays. Toss sweep with one and sometimes two of my really athletic linemen will be very difficult for defenses to deal with. All of my backs have a very good ability making people miss, and this will contribute to the success of the inside zone plays. Joe Adams and Reggie Bush are both very deadly in the open field, and will be factors on jet sweeps and reverses. The following link is my favorite play to get Bush the ball and do major damage to opposing defenses: http://smartfootball.com/run-game/my-favorite-method-for-running-a-reverse-to-a-wide-or-slot-receiver It was no accident the first two times Bush was used on reverse plays in Miami last year both resulted in touchdowns. I listed a ton of plays for bread and butter, but you get the idea. All of these plays can be damaging to the defense if proper angles, technique, and form tackling are not used. First and foremost, Andrew Luck. Given the sheer amount of plays, formations, shifts and motions in the playbook, his knowledge and understanding of the game are what provides me the opportunity to run this type of offense. T.J. Yates is very critical as well. His intelligence and understanding of not only what we do, but what the defense is trying to do will be highly useful for Luck. He is another set of eyes and ears to really cue in on finding the weaknesses of the defense. Tom Moore was once asked why no one received reps besides Peyton Manning, and his reply was that if “No.18 went down, we’re fucked. And we don’t practice fucked.” While $4 million was a considerable amount of money for a backup quarterback, Yates provides me with the ability to continue to run the offense I want in the event Luck were to miss any time. His work in the meeting and film rooms cannot be understated. Reggie Bush is the ultimate chess piece, and will be used in a different role from play to play. James Casey, Charles Clay, and Marcel Reece are all guys who can be equally effective lined up on the formation, out wide, or lined up in the backfield. Greg Little is someone who has unbelievable talent, and continued coaching and leadership will only go to keep his progression going where he maximizes his physical tools. 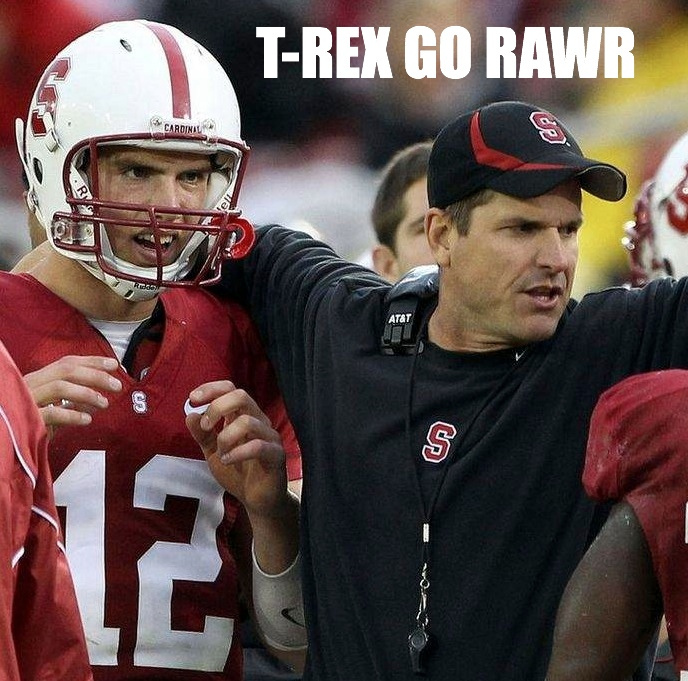 Coaches/Coordinators: Jim Harbaugh would be my first choice for head coach. His familiarity with Andrew Luck will help both have the comfort level one wants between coach and quarterback. Harbaugh is not above trying anything, understanding that the more we can do, the better we can be. I would have no problem paying Dana Holgorsen handsomely to be the offensive coordinator, as his understand of the spread/no-huddle, paired with his imagination offensively would help ensure defenses had no real clue as to what it was we were going to do. When scouting opponents, the teams are usually tracked on their last four game tapes. All of the different things we try and do are designed to help with breaking those tendencies that they want to key on. 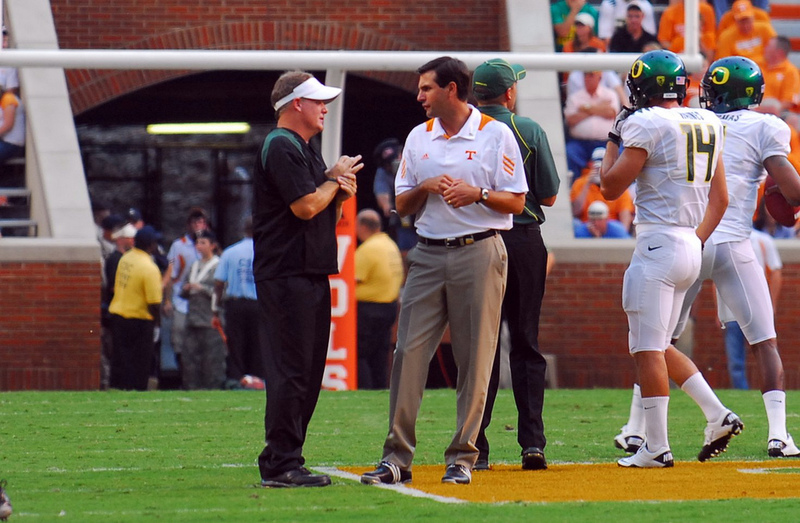 I would also add Mark Helfrich to my staff, as he has been a part of Oregon’s offensive staff the last two seasons, and he will help to add input to our read option running game. No matter what defenses have tried to do against Oregon, Chip Kelly and company. have done a great job adjusting and having new wrinkles ready to combat defenses. All three men are unafraid to think outside the box, and it is that “box” that I think most often times gets coaches fired. Fear of trying something new. Given the size, speed, and intelligence of defenders today, I need coaches that can give defenses pause when trying to play w/ the attacking, intimidating style that they love to use. A logo for Ryan Booher’s defense? Perhaps. Photo by A.J. McCann. I wanted players at all three levels of the defense with a knack for making plays first and foremost. Intelligent players with the versatility to line up all over the defense. Our base defense is going to be 4-3, as I feel that being able to generate pressure with the down linemen allows you to use the back seven in a variety of ways, keeping offenses off guard. I have the players with the skills to run a 3-4 look as well, depending on what the opposing offense does well. In-game adjustments are arguably as important as all of the game planning that goes on throughout the week. 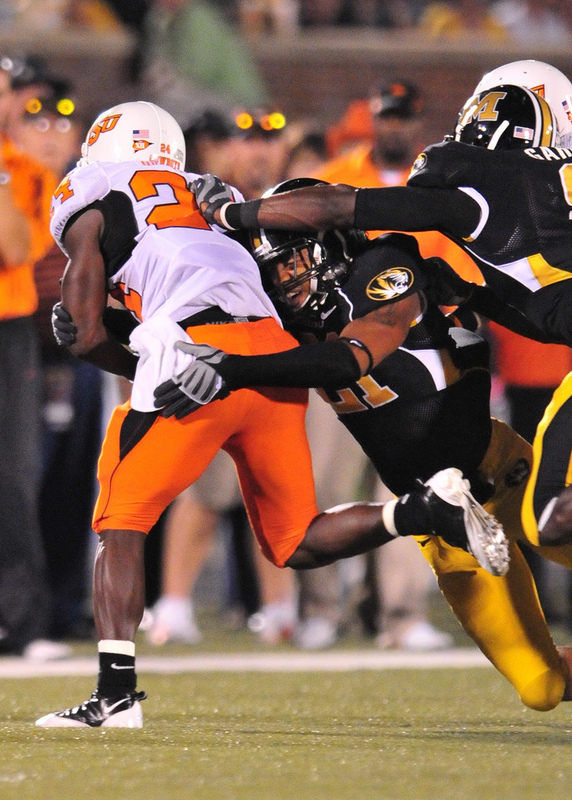 Finding the right defense for what the opposing offense is doing well is very important. One of the great answers to the spread in the college football is the 3-3-5. I have the players in the secondary that can help run this defense effectively. 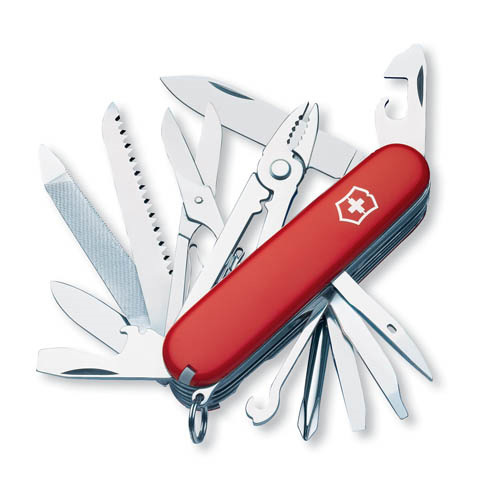 Most of my players are guys that are positional hybrids; Swiss Army knives in terms of what they can do. It doesn’t matter if it is Tom Brady or Aaron Rodgers, quarterbacks do not like being hit. All of my down linemen have the ability to generate a pass rush from a variety of spots up and down the defensive line. I have multiple options at linebacker with have good pass-rushing skills as well. Many of my defensive line players also have the athleticism/instincts to drop into coverage on zone pressures as well. All of the front seven are good tacklers, and I have quite a few guys that are really good strikers. Big hits are something I encourage, as long as they are within the whistle, and fall under the category of legal. A great motor is something required as well, as I want guys who never give up on a play and can gang tackle and find the ball. In the secondary, I have guys that are specifically on the team for tight ends, for slot receivers, for big receivers, and for running backs as receivers from the backfield. I have bigger guys to match up for size, and smaller, quicker guys to deal with the Wes Welkers of the world. K.J. Wright (No.34) embodies the mentality that Booher values in a defensive player. See below. Cameron Wake is the shining example for the rest of the defense. He plays with the same level of intensity whether the team is trailing by two touchdowns, or the team is 0-7. Attitude is contagious, and he is a guy who simply loves playing the game of football. Demario Davis, KJ Wright, Earl Thomas, and Jairus Byrd are all guys who are not only great football players, but leaders as well. All of the players on the team have a strong desire to be the best, hate to lose, and will help challenge and encourage teammates to be the best that they can be. There is only one player on the entire defense who really plays one role, and that is Mt. Cody. He has something that can’t be taught, however, and given the culture of the locker room, he will shine in his role. I remember Kirby Smart when he was a defensive back at Georgia and I’m not the least surprised he has become an excellent coordinator. One of my favorite choices of Booher’s team. Photo by Matthew Tosh. Kirby Smart would be my choice for defensive coordinator. Anyone who has watched Nick Saban’s defense has to be impressed with just how multiple his defense is. Smart has experience in the NFL, so this isn’t something entirely new to him. 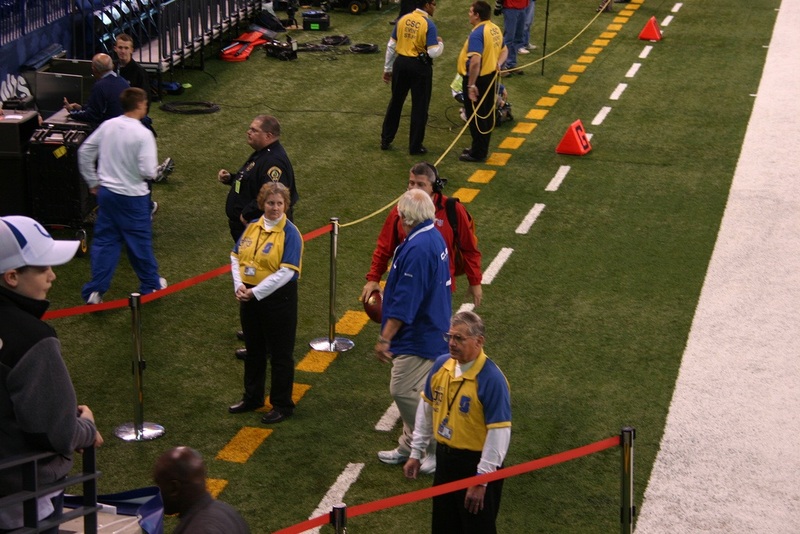 His knowledge will be something that shines through on not only the field, but in the film and meeting rooms as well. 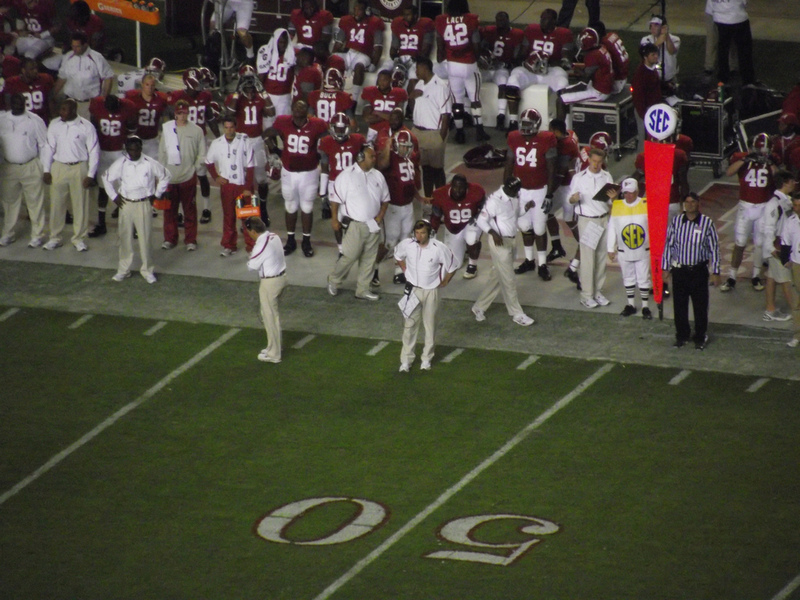 Working under Saban takes a certain degree of mental toughness, as he is famously demanding. That demanding style requires accountability, and that is at the heart of what makes great defenses click. Players have to possess complete trust in each other that the sum of parts is greater than the whole and that they will do whatever it is they are asked each and every snap. Smart is fantastic at communicating with the players in a concise manner, and as is the case with most Saban disciples, he is very good at making the needed adjustment on the fly. I would also hire Ed Donatell, as he has a resume filled with both college and pro coaching experience. He is very hands on, and given the resources I put into the secondary, I know he can get the best out of them. Good A-Gap pressure makes even the best quarterbacks feel like this. Photo by Colby Cosh. My interior offensive line is high on athleticism, but could be vulnerable to double A-gap pressures. Given the youth, any breakdowns in communication could be hurtful as well. I hope that Andrew Luck and his exceptional pocket awareness and athleticism can help alleviate some of those problems. My tight end and H-Backs all aren’t guys that you would generally put in the inline position. Vonte Leach and use of tackle eligible plays are my hopeful answer when it is time to run the ball. Clay and Casey both have experience in the backfield being used as blockers, so it is not like they are complete novices. 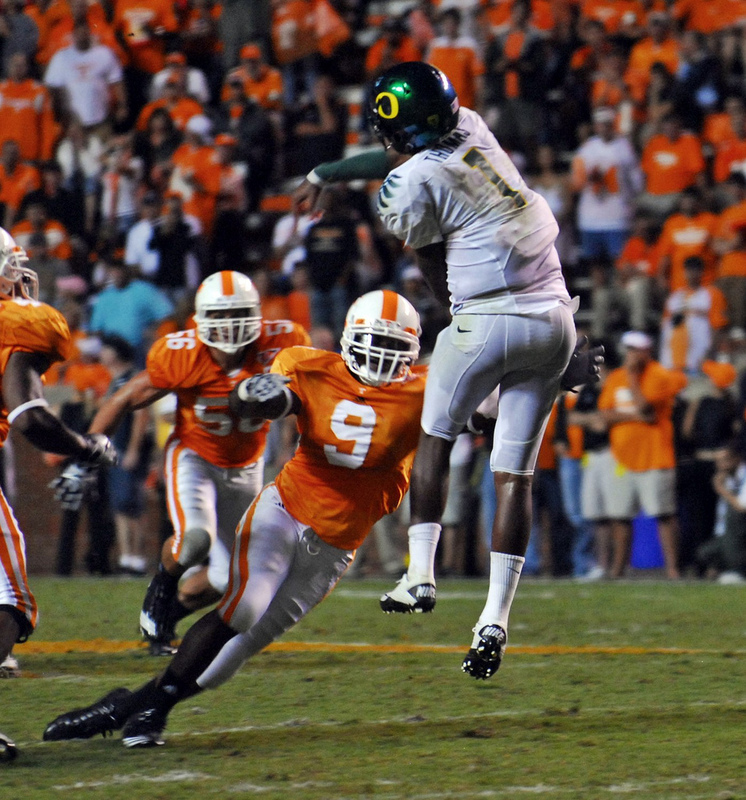 When Darron Thomas or Josh Portis are on the field, they have to have a total understanding of the importance of holding onto the football. When an offense does the multitude of things that mine does, there can be some merit to the idea that they don’t do anything exceptional. Outside of the read option plays, many of the plays will be the same, just run out of different formations and personnel groupings. Built specifically around speed and versatility, were a team to line up and decide to pound the football straight at us, it could be a long day for us. Also, we are very aggressive in our pursuit to the football, so plays taking advantage of this could cause us some problems as well. Reshad Jones and George Iloka both have skills in coverage, but if a creative offensive coordinator could get them matched up with the right players, they could be abused as well. Wright and Davis are still very young players, so they could be taken advantage of as well. Really that statement could be said for the bulk majority of my team. Any communication breakdown could be very costly. I placed an emphasis on really good coaches as far as teaching, and the required time in the film room is something that all players will be doing. Who are your stars and why did you invest so much in them? Andrew Luck, Reggie Bush, Matt Kalil, Cameron Wake, and Earl Thomas are the biggest names and highest costing players on my team. It has long been argued that the four cornerstones of every team are quarterback, left tackle, dynamic pass rusher, and shutdown corner. Bush is my ultimate chess piece; a weapon that will be used in many, many ways. All five players are also hard workers, team first players, example setters that understand what it takes to be successful in such a tough league.Most importantly, they are great people, great teammates, players on the team will gravitate towards them and run through the proverbial brick wall if need be because of these kinds of players. One simple question that each player on my roster has the same answer of “yes” : Do you love football? These are the guys who will make the game fun, and when adversity presents itself, won’t let the overall attitude of the team steer in a direction that deters us from getting to our ultimate goal. 49ers RB Kendall Hunter is a Booher fave and an experienced cog in a Dana Holgersen scheme. Photo by Wunderlich Photography. Kendall Hunter is a player with no real weakness, and he strives to always find ways for improvement. Both Greg Little and Lestar Jean have the ability to turn into game dominating receivers, as they are handfuls for a defender to deal with. Charles Clay will only continue to get better with increased reps, and improved technique through coaching. Jah Reid has position versatility, and could be effective at four spots on the offensive line. Using him in the tackle eligible package will go a long way in getting him further up to the speed of the game. Olivier Vernon is my best mold of clay on the entire roster. His strength is incredible. With the proper coaching and learning how to be a pro from Wake, he could be a major threat as a pass rusher in a deep rotation. James Michael Johnson and Demario Davis are guys who can have an impact now, but develop into bona fide stars with the proper development. Josh Norman has the potential to be an elite CB, and George Iloka is the type of defender that will be in vogue in about five years. The loser of the spread quarterback battle between Portis and Thomas almost certainly would not be on the team at the end of the year. Yates has some trade value. Were a team to lose its starter and need a reliable option to get through the season he could be had for the right price. James Casey is someone who I am using more based on projection, and if he doesn’t take advantage, the added depth at the position could find him on the outs. 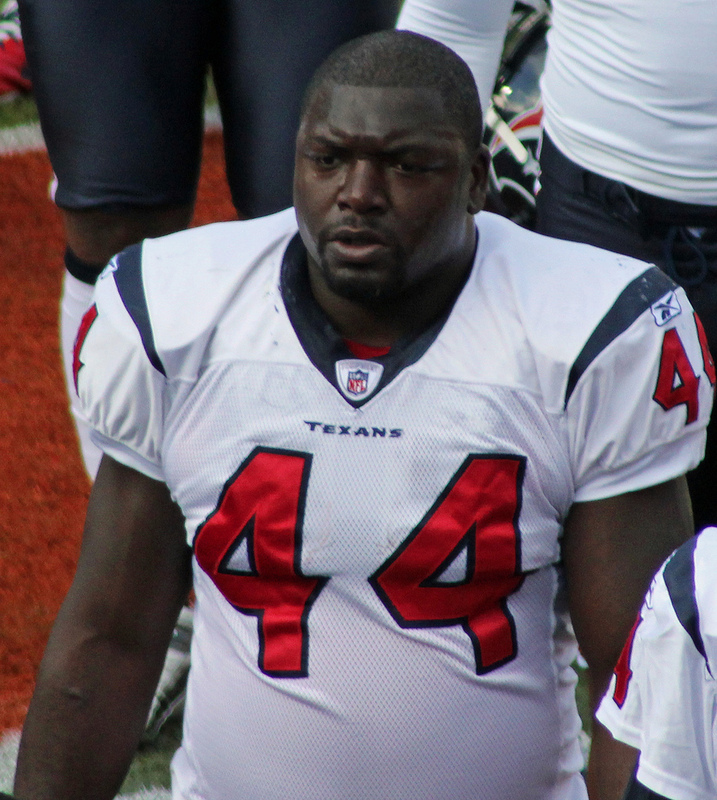 Vonte Leach and his $3 million value means that he must be exceptional when used. I love his attitude and nastiness, but if his play doesn’t match his salary, he would be gone. Amazingly, the only real person I feel has something to prove on defense is Maualuga. He must play within the design of the defense, and reckless play would be a quick way to the outs. What was the most difficult part of the selection process for you? Trying to find a team that had as much balance as possible yet with no really exploitable weaknesses. Finding players that weren’t the proverbial “one-trick ponies” also proved to be a difficult task. I almost sacrificed Andrew Luck, but given the absolute importance of the position to be successful, he had to be kept. The lowered cap, combined with increased offensive line values, hurt the overall depth of my team, but I was able to field a competitive team. Also, avoiding players that could negatively contribute to the overall culture of the team proved tougher than I had first thought. Based on your roster what type of playing facility would you want as your home stadium (describe the facility as outdoors, indoors, turf, grass, climate? The team is built around speed, so a fast surface indoors would be most preferable. However, given our no-huddle offense, I would want the stadium to be somewhere in a very hot climate, using the heat to our advantage. If I could have a stadium with an open roof similar to Dallas, I would be open to that idea as well. I feel that grass is much easier on player’s knees than turf, so I would want grass for my playing surface. I feel confident my team could go to the Superdome, to Foxboro in January, or Miami in September, and not be at a real disadvantage. Is Vonta Leach risky? Perhaps for this scheme and the funds doled out. Photo by Jeffery Beall. Name three risky personnel selections on offense and explain why (talent, off-field, age, injury, fit, etc. ): Vonta Leach and his $3 million dollar salary could be money better spent elsewhere. In reality, he would have to play to his best for the contract to be worth it. However, I want the Ray Lewis’ and Patrick Willis’ to have something else to worry about when trying to hit that hole. Jason Kelce and Lydon Murtha also need everything to go right for them, or could also prove to be mistakes. However, with strong backups, I feel as though I guarded against that. Name three risky personnel selections on defense and explain why (see above); Adding Mt. Cody for only one role, even at his relatively low cost, could blow up in my face if his work ethic were not where I think it would be with the players around him not allowing those things to happen. If Maualuga were to play outside of the confines of our defensive scheme, we could really be gashed in the running game. And compounding that, having Earl Thomas and Jarius Byrd and their smaller frames in the starting lineup leave me vulnerable to heavy run teams. My 3-4 front is my hopeful answer to that potential problem, but if we are in the playoffs, the time for adjustment might be too little, too late. Name a few players you really wished to add, but couldn’t find the room due to the restrictions of the salary cap or the fit within your team’s system: Aaron Rodgers, Drew Brees, Tom Brady, and Cam Newton! I think everyone would want to have those guys on their teams. Percy Harvin at $8 million was someone I couldn’t justify. Aaron Hernandez was someone I really wanted, but I was able to add three similar players for the price it would have cost for him. David DeCastro was someone I really wanted to use, considering my added emphasis on pulling. I felt the money was better spent on the two tackle spots though. Lavonte David was someone I would have loved to add to my athletic linebacker group. Vontae Davis ability in run support would have been a big get for my secondary, too. Andy Lee and Shane Lechler are such weapons at the punter position, but their salaries were a tough pill to swallow. Which players on your team would you have added even if they cost more than the listed price? Andrew Luck, Reggie Bush, Matt Kalil, Cameron Wake, and Earl Thomas. They are my superstars, and that is no coincidence. They each represent everything I want out of a professional, and the leadership they provide permeates all throughout the locker room, the meeting and film rooms, and the weight room. They understand you can ALWAYS get better, and as I said earlier, attitude is contagious. How do you think the makeup of your roster and distribution of your resources illustrates where your philosophy breaks with NFL conventional wisdom? Running a spread/read option offense as a supplement to my base offense goes against conventional NFL wisdom in a variety of ways. Read any scouting report on the hybrid tight ends each year, and you will hear about their lack of skill as inline blockers. Given the match up problems they give defenses, and the comfort level they give the quarterback, I could really care less whether they can block elite edge rushers anyway. To me it is bad coaching if I expect Aaron Hernandez to block Cameron Wake or DeMarcus Ware in the first place. Earl Thomas, Jairus Byrd, and Demario Davis are all guys who don’t fit the accepted size requirements many teams adhere to, but they make up for it in spades in everything they can do. I paraphrase JFK with my beliefs on building a team, and it goes like this: Ask not what the player can do for you, ask what you can do for the player. Finding good human beings who love the sport of football, that understand the importance of TEAM, is the key component from which my football team is built upon. How much of a priority did you place on special teams, considering the restrictions of the salary cap? How would you rate your special teams unit? I understood the importance of special teams, and how it is a good way to get young players and backups on the field and embrace competition. Given my lack of huge contracts, I was able to have a relatively deep roster with guys I felt would help the team in any way they could. Ben Jones might not have great long snapping skills, but being a four-year starter all up and down the offensive line, I don’t think that is something above his mental aptitude and skill set. Overall, I feel that there is no real weakness on the unit, as I have players who have the mindset required to be impact special teams players. I have complete confidence in Alex Henery, no matter the situation and accompanying pressure. Having James Casey as my PP helps give the opposition one more thing to have to worry about.